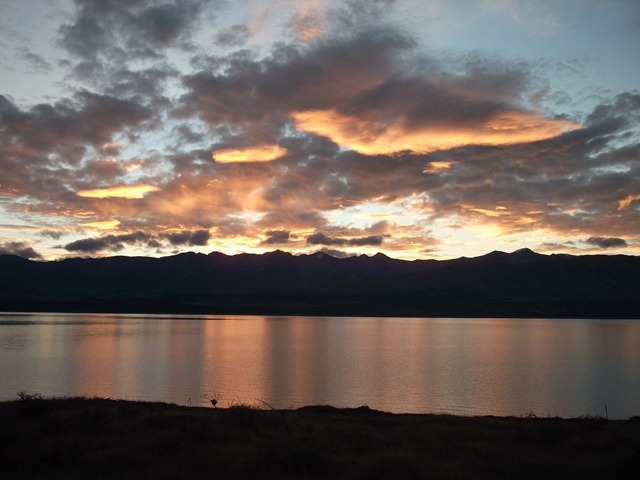 After leaving our lovely parking spot beside Lake Pukaki, we headed toward Twizel as we really needed to get some washing done and to power up, as shock-horror, we were down to 50% power! !Hmm, 50% full or 50% empty? depends on your viewpoint! 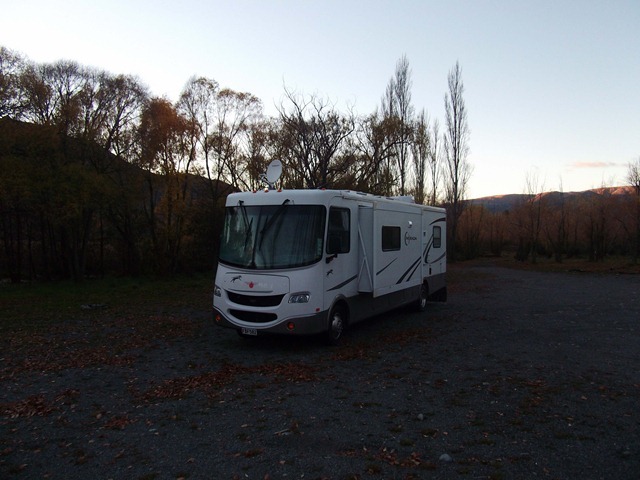 A pleasant 24hrs was spent at the Twizel camp ground catching up with chores and refuelling ourselves as well as the batteries. That done, we headed off from Twizel through Oamarama and decided to see if we could find a nice spot alongside Lake Benmore. We found a delightful spot where by the end of the afternoon a couple more campers joined us. We thought that we would stay here for a couple of nights to rest and relax. Bernice decided that she would have a go at using the motorhome oven to bake some bread. The baking event turned out to be a great success except that the bread had a very flat top as the space in the oven is such that the top of the loaf sat along the top of the oven, hence the need to replace the said oven! The following day, we had a call from Anne & Paul who decided that they would love a drive up to Benmore to visit for lunch. As it was a grey old day, Bernice made a lovely Leek & Potato soup to go with the wholeseed bread made the day before, as well as a batch of delicious Lemon muffins with a surprise cream cheese centre. After lunch, we thought that it was the perfect sort of a day to have a game or two of Sequence. After a few hours playing and laughing lots, let us just say that the women proved to be totally unbeatable! Thursday morning dawned and it was timely to head back to Oamaru, although we had to fight the gale force winds all along the valley. 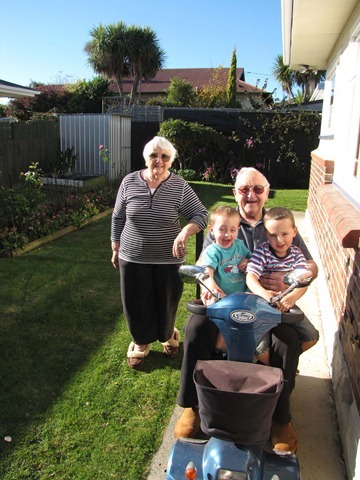 Friday, and Steve & Les were due to arrive bringing with them their grandchildren Ben & Asher for a visit to see their Great Grandparents. They duly arrived and the next couple of days were spent trying to keep up with Ben & Ash. The brains trust trying to install a T-stick despite the wonderful!!??? support of Telecom. 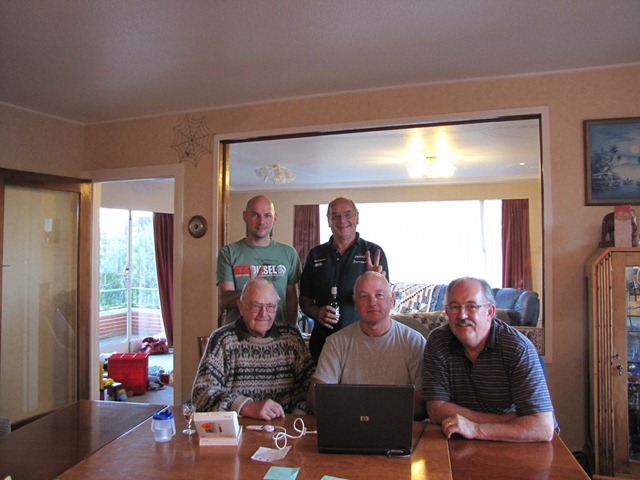 A lot of laughs were had, but before too long it was time for them to all return to Auckland. We are now imposing ourselves on Mike & Ann for the next wee while, whilst we get a few bits & pieces sorted including; accounts, business, banks, and motorhome refurbishments. The latter is all organised and the van goes into the workshop on Monday 13th June. We just have to sort out choosing of colours, materials etc as well as a new oven!!! Oh and the other thing on the “to do” list is to find a vehicle to tow along behind us. Watch this space. Saturday dawned rather overcast and then proceeded to start to drizzle. Decided it was time for a change so out with the maps and plotting a route. Also faced a need for water and dumping of waste. Decided that we would head home via the Lakes so the next port of call was to be Fairlie where there was a POP suitable for large vehicles and a public dump station. 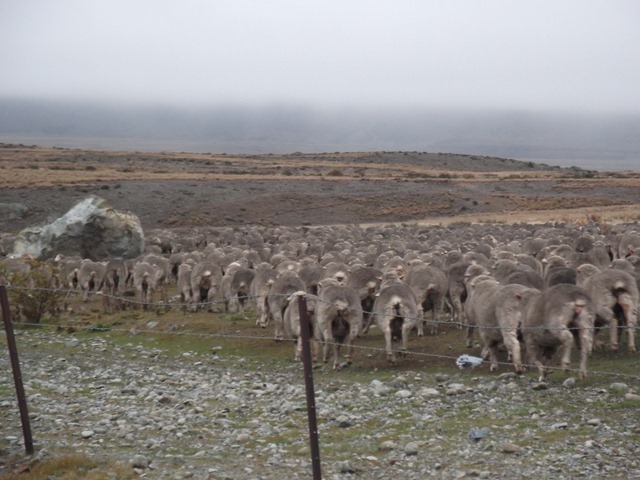 Turned off SH 1 at Orari and made our way through Gapes Valley, Beautiful Valley and Cattle Valley to arrive in Fairllie. Arrived to a light drizzle, but found an excellent dump and fresh water (amazing the change in ones life and the accompanying change of priorities. Who would have thought that dumps and fresh water would become items of major importance!!!). Phoned the POP and were advised with the amount of rain they had had they could not provide hard ground for a large motorhome. Time to rethink. Found there was free parking around about Tekapo and through the canals so we headed off to Tekapo. Arrived in time for lunch at the end of the Lake. Then proceeded up the east side of the Lake but everywhere we thought looked a good spot had no camping signs so gave that away. 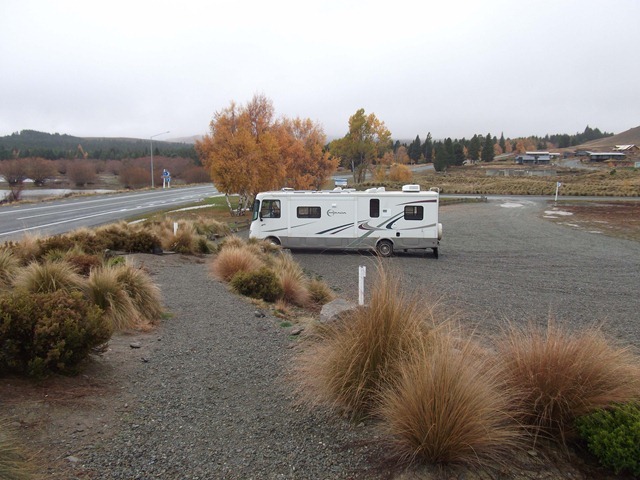 No camping in Tekapo itself so then had a look at Lake Alexandrina but the entrance appeared a little narrow and also soft. 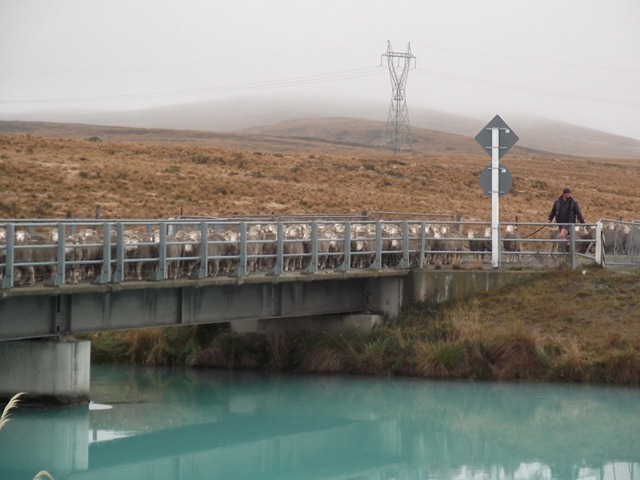 So the next port of call has to be the Tekapo canal. 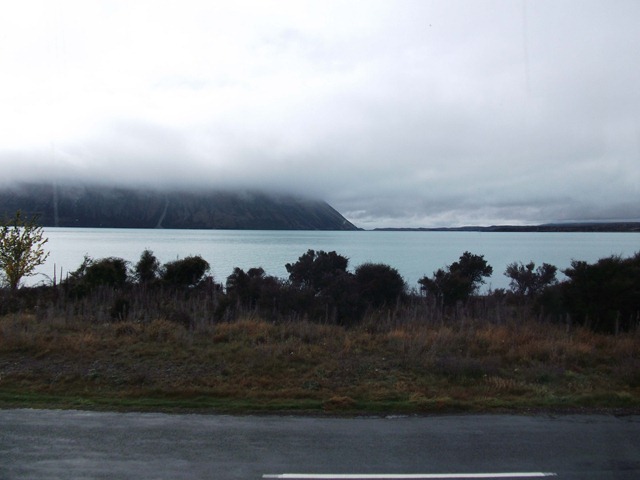 But again we were thwarted, as the first part of the canal from the foot of the Lake to the intersect with SH8 was closed, so we headed for the second section from SH8 to Lake Pukaki. At last we found a spot to camp. It was alongside the first bridge across the canal and provided room to be off the road onto hard ground. Peace and quiet, the canal road had a minimal amount of traffic with long periods of solitude. 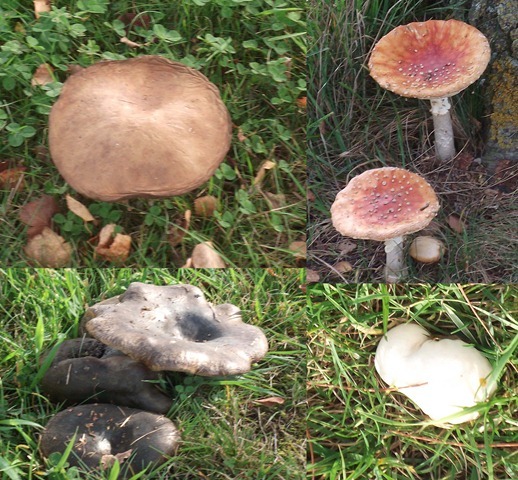 The weather had improved, the sky was clouded over, but no rain or wind. Office set up and running so work can go on. 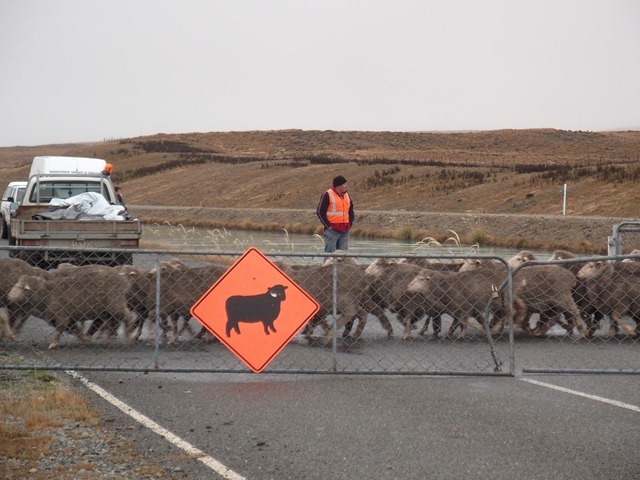 The next day we were treated to the sight of Merino sheep being moved across the road from one side of the property to the other. They were ewes being moved down to better grazing prior to the rams arriving next month. A mob of about 2,500 was shepherded across with the canal road being shut off temporarily. A further mob of around 500 was moved the next morning. We had a further day of overcast conditions but not cold or windy. Managed to get some work done and tidied up the motorhome somewhat. Overnight we had had almost continuous rain, not heavy but just persistent. Next morning we decided to move on. Heading toward Twizel to do laundry and get supplies. Made our way along the canal then down to Twizel. 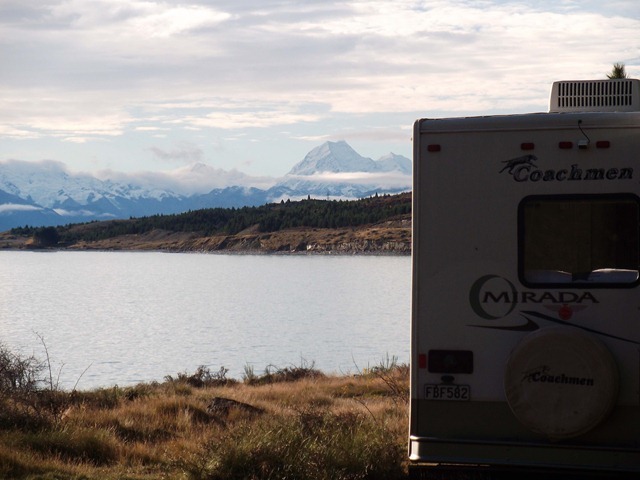 No luck with laundry facilities there, so back along the north side of Pukaki where we found a nice wee spot to park. 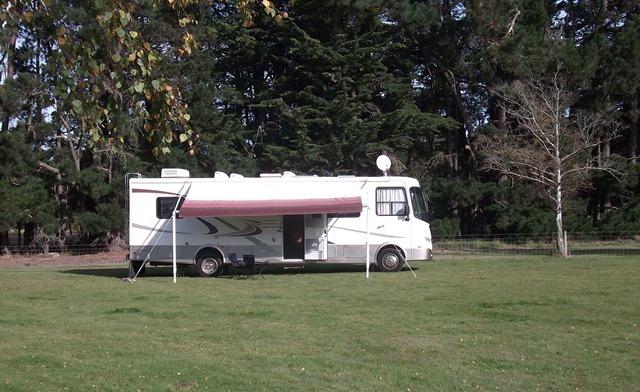 Before we left the glorious weather in Oamaru, we caught up with such chores as laundry, shopping and washing the van. 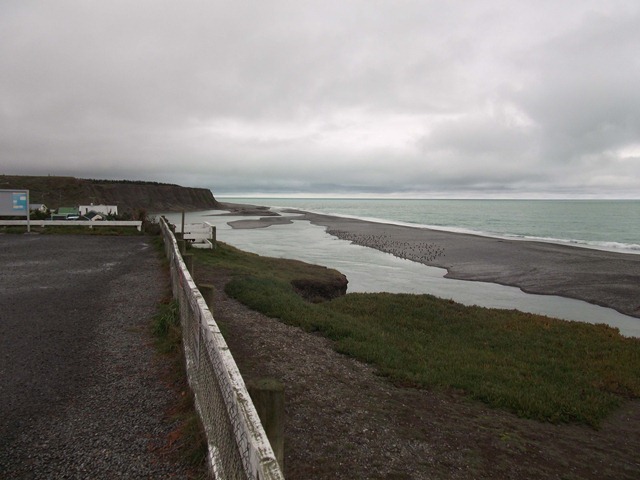 We headed off from Oamaru on Sunday afternoon to slowly wend our way toward Ashburton scheduled to arrive Monday afternoon as it was Theo’s 3rd birthday on Tuesday. We called in to see Anne & Paul along the way, this time NOT parking in the mud! We left their place and headed toward Ealing where we knew there was a good parking spot. Before we left Oamaru, Bernice had noticed that the fridge was not working particularly well, but was told that it was as a result of parking on a slope at Mike & Ann’s and it would . But by the time we arrived at Ealing, it was evident that the fridge was definitely not working. That necessitated a change in plan, so it was up and off into Ashburton on Monday morning to find someone to fix the fridge. Of course, it seems just our luck that things are not meant to be that simple. Once the fridge was removed from the van, many hours were spent turning the fridge over and over (apparently this can get them working again – go figure! ), it was decided that the fridge was not going to be resurrected, therefore we needed a new one. 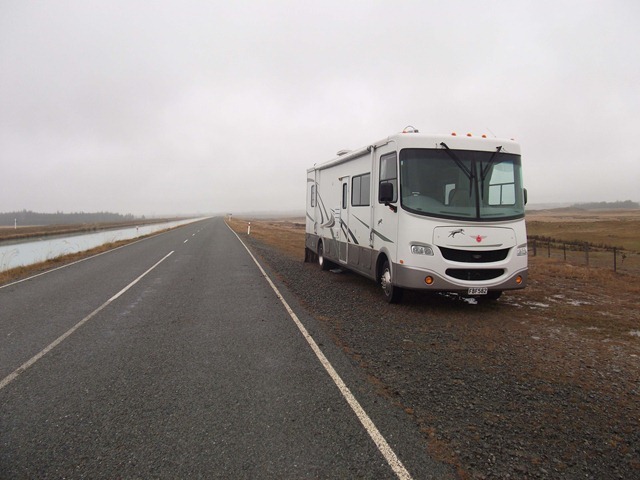 Luckily, B & V Motorhomes just happened to have a new one the right size in stock, so the next hour or two was spent installing it. We eventually arrived at Jason & Erica’s in the early evening, a little later than originally anticipated. Tuesday was Theo’s birthday, much excitement and anticipation all around. Erica made this lovely cake with all the appropriate Bob the Builder machinery, and earthmoving accoutrements that a 3 year old could desire. 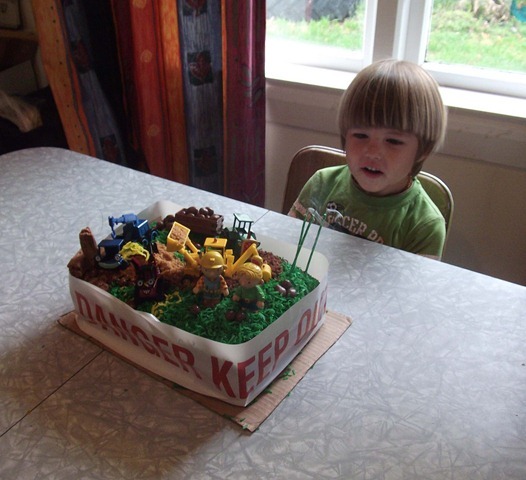 Theo and Bob the Builder cake, what more could a three year old want. 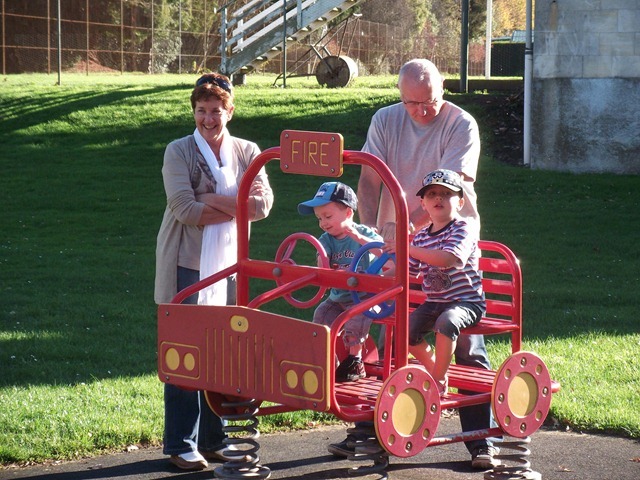 The following day was spent doing various chores in Ashburton and having a final dinner with Jason, Erica and the grandchildren. 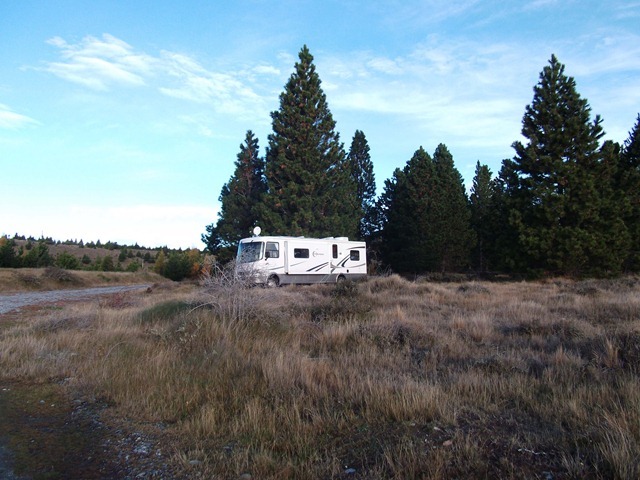 Thursday we were off again to find somewhere to spend the night on our way back to Oamaru. 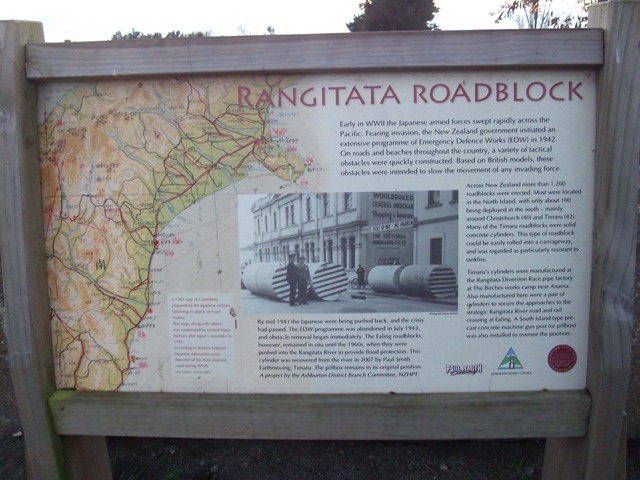 We decided that we would take a slow trip back and visit some byways rather than heading straight down SH 1. 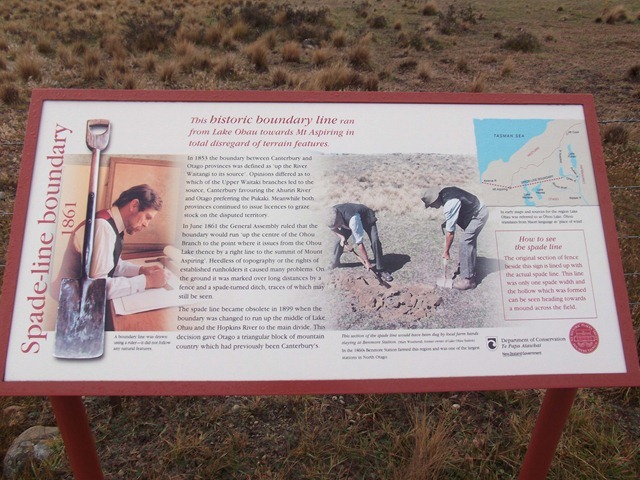 We went into Ashburton for supplies and were then to head to Methven and follow the Inland Scenic Route home. 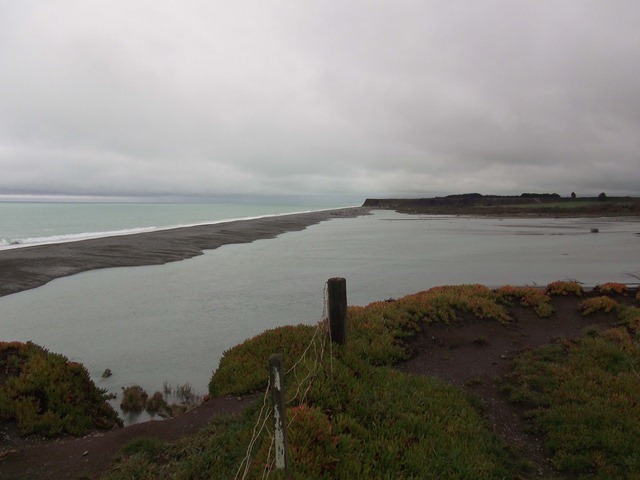 However plans change and we decided to go to Hakatere Mouth (the mouth of the river that flows through Ashburton). The parking here had received good comments on a couple of sites. Arrived to find a settlement not dissimilar to several at the mouths of South Island East Coast rivers. A private area enclosing about 100 cribs with a parking area on a different level. The first thing that was noticeable was the strong smell of fish from the onshore breeze. 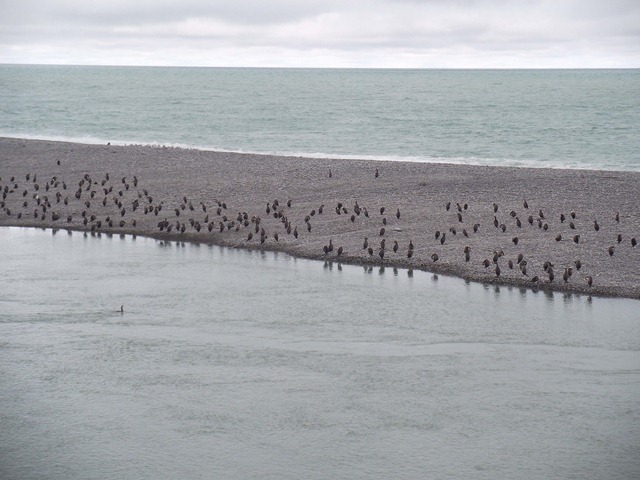 Obviously there were or had been a large number of fish taken by the shags sitting on the beach, and they were adding their aroma to the area. Shags at the end of the road on the shingle bank between the shore and the open sea. The southern end of the river mouth where the river meets the sea. The mouth at this point is barred and the river exits about 500 metres to the north. The camping area held no attraction for us so we made our way south to Ealing for the next couple of nights. The eldest (and only) son of the union of Bernice and Roy has voiced his concern at the lack of mention of the above said person within this blog. Thus, this entry. Thanks must go to him for his many helpful journeys around Auckland, starting from picking us up from the Airport (delegated somewhat to older brother Simon), picking us up from the Electricians when we had to leave the motorhome for the electrical upgrades. This was particularly meritorious as he had just finished a long night shift and had had no sleep. But more than anything it was just very nice to see him looking so well and obviously enjoying what he was doing, both at work and his his leisure hours. 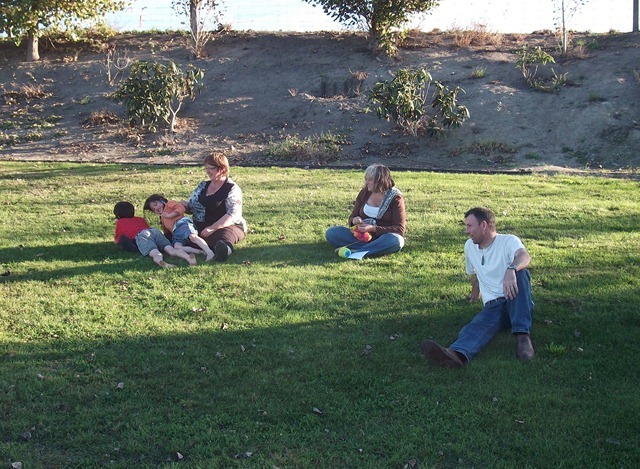 In particular his relationships with his cousins and uncles and aunties was enjoyable to watch. So all in all, thanx son. Easter weekend rolled around all too quickly. We left Oamaru on Friday to start our journey towards Eiffelton, to Jason & Erica’s as it was Andre’s first birthday on Anzac Day. 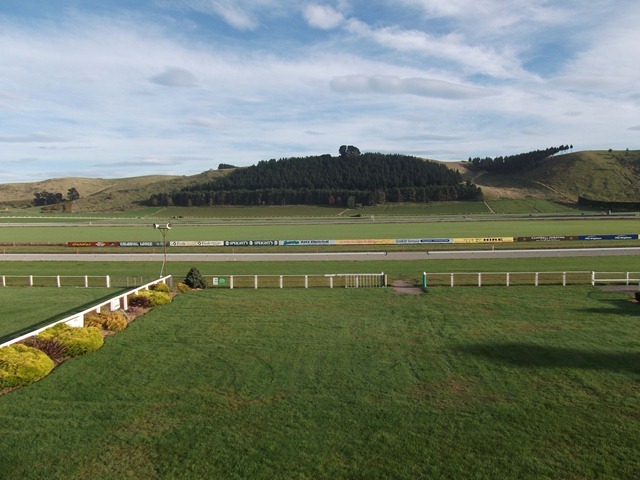 After spending the night at the Oamaru Racecourse (by way of a trial) we headed out of town and got as far as Hook, where we called in to see Anne & Paul. We stayed for a cuppa and then were to head on our way. BUT, the greatest plans of the Vannini’s were to go awry as when we got into the van to drive off, one wheel was carefully off the driveway and on the very soft grass in a ditch. The next two hours were spent getting covered in mud, as we tried to get the van off the road. We tried towing it with Paul’s vehicle (van started sliding sideways), filling the hole with bricks, timber, planks, sacks, tiles…you name it, we tried it! With much manoeuvring, pushing, shoving and great skill and man power (Paul outshone us all! 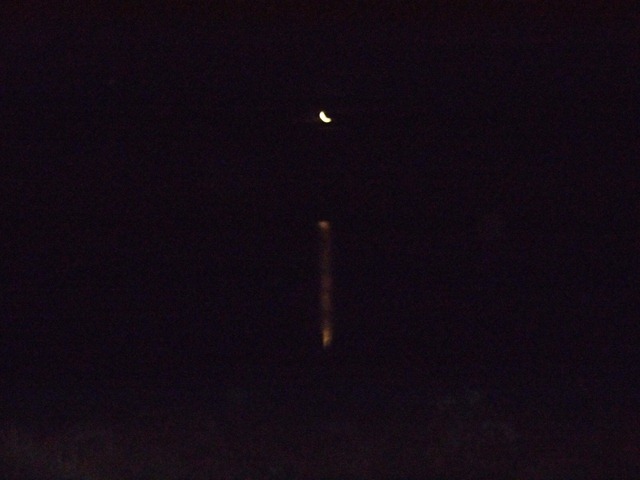 ), we managed to get the van off the road safely to leave for the night. 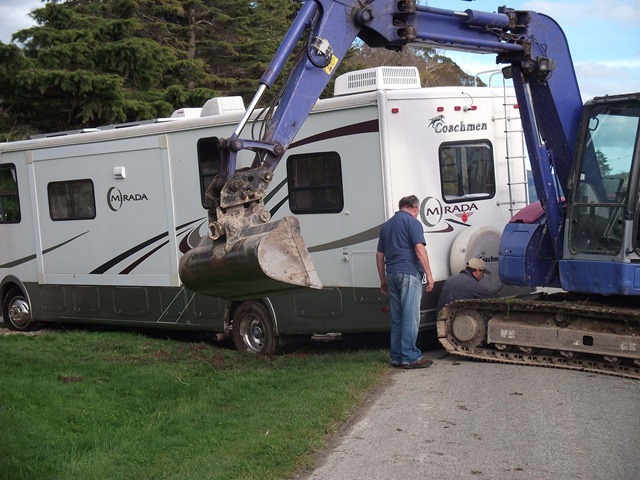 Saturday morning, Steve (of Muir Contracting) came to our rescue with his truck and digger. The truck was hooked up to the van to try and tow it out but, but the lack of room on the road, that plan was abandoned as the combination of the angles and the lack of space continued to make the van slide precariously sideways. Plus we had to make sure that the hydraulic jack underneath the van was clear of the bank. 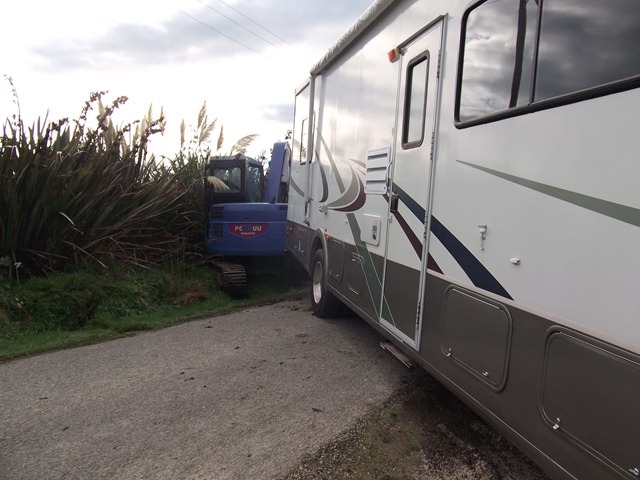 The digger was unloaded from the truck and Steve managed to dance it along the road to hook it up on a short chain behind the van to drag it out. Success at last. Very carefully the van was pulled out of the mire and onto the road. We cannot thank Steve enough for his fantastic work and patience. 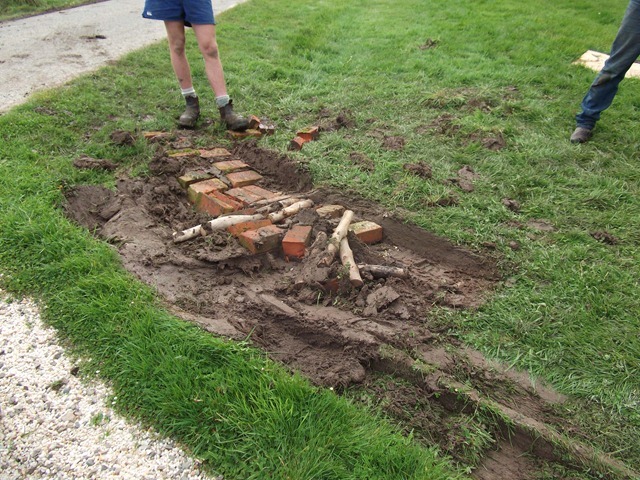 Anne, Bernice and Roy cleaned up the mess as best they could, by removing the wood and timber, replacing the bricks and tiles, and putting back some of the grass sods Paul had dug out the previous evening. HUGE thanks to Anne and Paul for all their hard work in trying to get us out plus their outstanding hospitality. Thus at nearly midday we headed northwards. Our parking spot for the night had been chosen as the NZMCA park over spot at Ealing. A lovely wee spot where there was just one van already parked, but we were soon joined by a couple more later on in the afternoon. Here we settled in the sun for a relaxing afternoon under the awning. Over the fence from the Parking area was this small country church, well preserved and still in use. 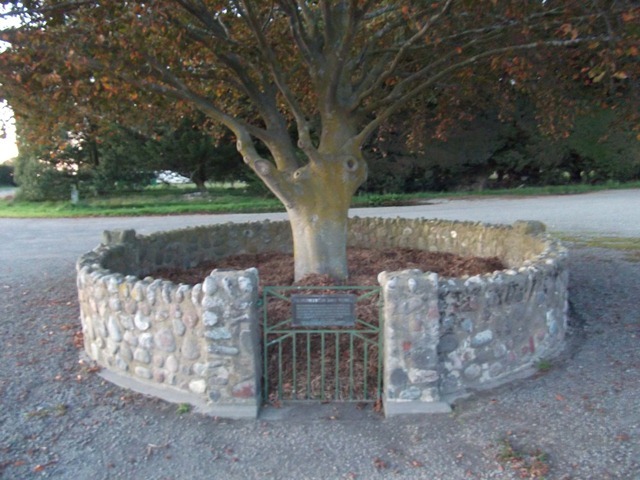 Along the road a short way was an oak tree planted as a memorial to a young local Air Force pilot killed in action during the Second World war. 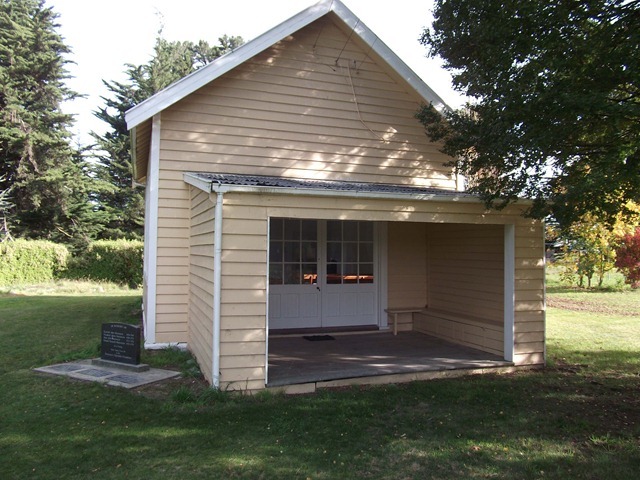 It was here that the local memorial service was to be held on Anzac Day. Sunday, bright and early, the wanderer went exploring the vicinity of the parking area. Close by was the public picnic area on State Highway 1. 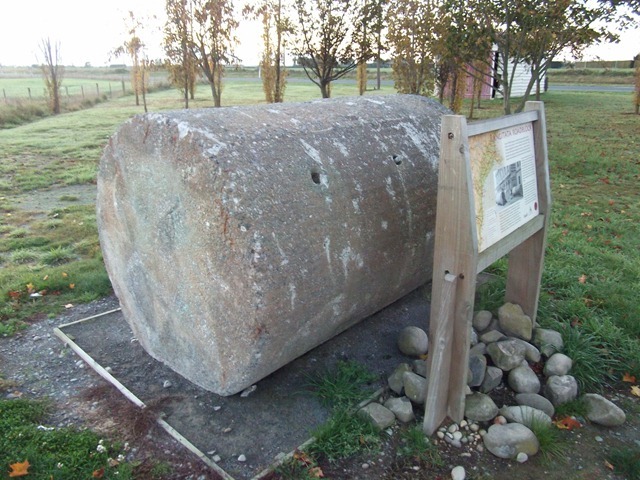 Here there was a large concrete roller, or so it appeared, with an interpretation board. On closer inspection it turned out the apparent “roller” was in fact a WW2 relic. It had been cast as a road block to be used in the case of a Japanese invasion. 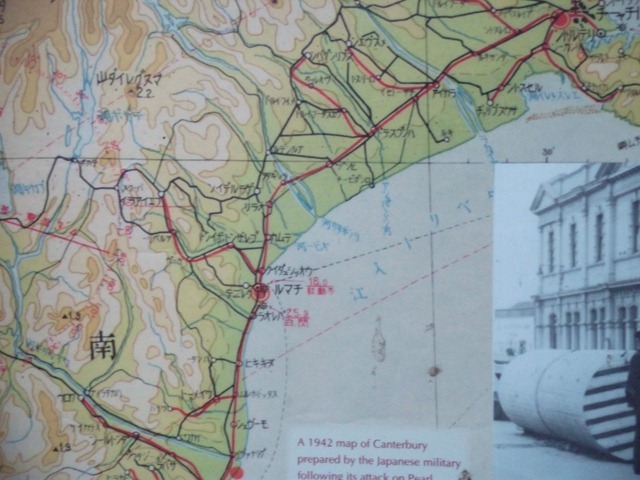 Also on the board was a copy of a map prepared by the Japanese for use in case of an invasion of New Zealand. Amazing what one finds when you take the time to stop and wander and wonder. Sunday we headed the short distance on to Eiffelton to spend the next couple of nights with the grandchildren. A lovely weekend was had and Andre’s birthday celebrated well. 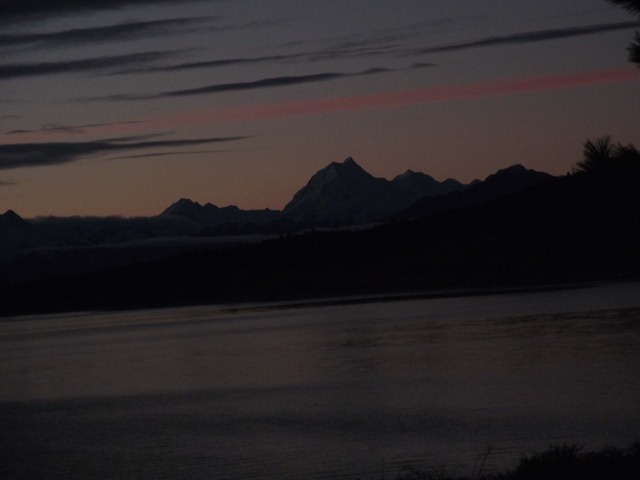 Included was a trip to Lake Hood – the Pauanui of the south! 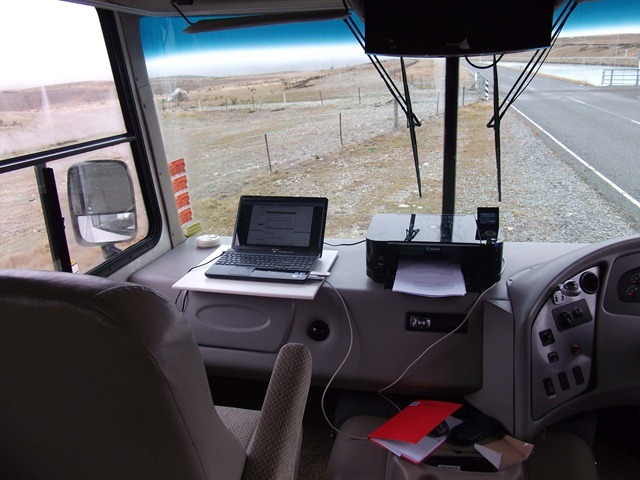 Tuesday we were back on the road to Oamaru as we had a few appointments to be kept, including one of taking the van in to get a quote for all the inside work to be done.